Ideal for children, ideal for garden and outdoors - 75 hours of light with one set of batteries! The convenient light is provided by 12 durable LEDs. The ideal commodity for evenings in the garden or outdoors. 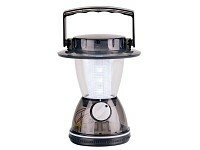 The LED Lantern is perfectly suitable for children. One set of batteries lasts for about 75 hours.